One of the 9 trays removed from the coin cabinet of Arthur Conan Doyle. In the Fall 2014 newsletter of the BSI Trust, there was an announcement that a 10”x 11” coin tray which housed coins belonging to Sir Arthur Conan Doyle had been donated to the BSI Trust. In talking to Andy Solberg, chairman of the BSI Trust, he mentioned that he would be taking possession of that coin tray during the January 2015 BSI Weekend and arranged for me to get a picture of the coin tray. It is believed that the wood tray dates to the 1920’s and measures 10 inches by 11 inches, with holes for 56 coins. 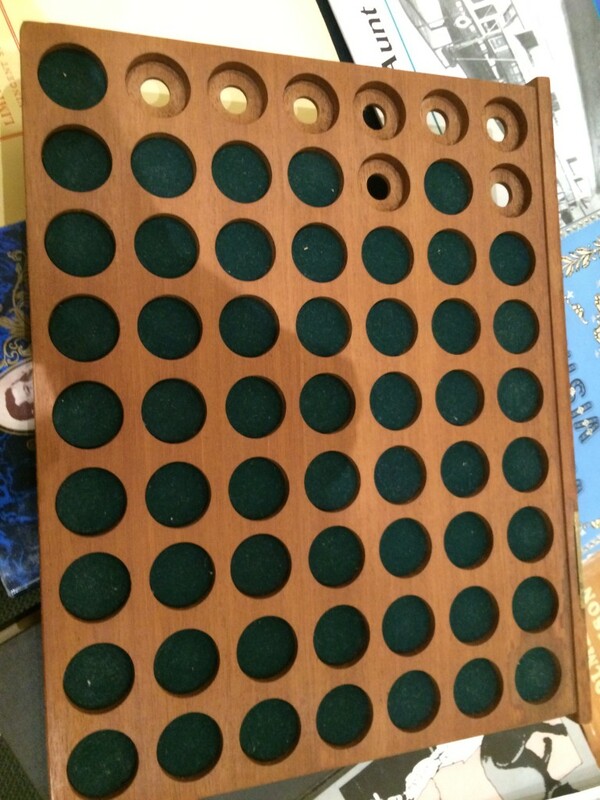 Eight of the holes are missing the felt inserts. 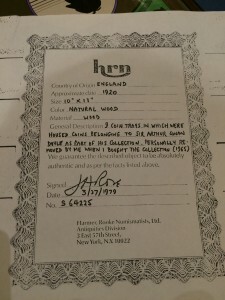 Below is a copy of the certificate of authenticity signed by Joseph H. Rose in 1979, who sold the collection while working at Manfra, Tordellla & Brookes in 1968. It’s a shame that the trays were removed from the coin cabinet in the mid 1960’s and dispersed individually over time. They would have more value as a complete set, rather than nine separate trays and an empty cabinet. Oh well! Joseph H. Rose, who signed the COA above for the coin tray and all of the folders for MTB’s sale of Sir Arthur’s ancient coins, served in Air Corps in the Pacific theater during World War II and was a correspondent for Stars and Stripes. Returning back to Manhattan after the war, he began selling coins in 1946 and created the coin department at William Holzman and Company, where he was employed until 1964. He was recruited, in 1965, to join what would become Manfra Tordella and Brookes, where he handled the sale of the ancient coins from the Conan Doyle collection. 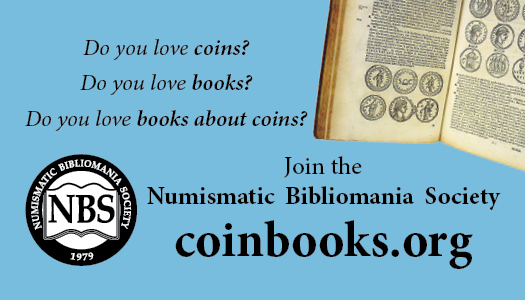 In 1969 he joined Harmer Rooke & Co. and created Harmer Rooke Numismatists, Ltd. in 1972.. He retired in 1988 and his collection of large cents was sold at auction by Harmer Rooke March 15, 1990. He passed away in 2003. Thanks to Andy Solberg, Chair of the BSI Trust, for his help! This story was highlighted in the March 6, 2016 issue of The E-Sylum and can be viewed at http://www.coinbooks.com/club_nbs_esylum_v19n10.html#article25. The COA state the tray to be 10″x13″ which is quite large as coin trays goes. I would be interested to see the actual cabinet itself, maybe it has the manufacturer name plate?